We have combined the venerable 80mm ED doublet optic with our new 2.5" rack and pinion, dual speed focuser to produce the highest quality and most versatile 80ED ever. The hand figured, extra low dispersion doublet will provide sharp high contrast views. The focuser has a higher lifting capacity and is smoother than import 2" Crayfords. Add to this that one can thread on the photographic field flattener and you have a superb visual and photographic instrument. This telescope is also available in a lightweight carbon fiber tube and dew shield. The SV80ED has a lightweight aluminum tube and dew shield. It weighs only 4.8 pounds without the ring, 6.4 pounds with it. It comes with a cnc clamshell ring, flat mounting base with three 1/4-20 threaded holes, 2.5" Stellarvue rack and pinion, dual speed focuser with 2" and 1.25" compression ring adapters. All aluminum, fully baffled, precision machined optical tube assembly. Exterior painting is stardust white. 4 1/6" diameter fully retracting aluminum dewshield. Exterior painting is stardust white. Silkscreened or laser engraved SV logo. Stellarvue SVF25 2.5" dual speed, precision rack and pinion focuser focuser with over-sized rotator, 2” and 1.25" compression ring adapters. Threaded to accept SFF7-25 and SFF3-25 dedicated field flatteners. Stellarvue’s Easy One Touch, cnc clamshell mounting ring with flat base. Has 1/4-20 threaded holes on bottom for mounting to a heavy duty camera tripod. If a mounting rail is needed, use the TP14 for mounts using a Vixen style rail and a TP6 for mounts requiring the Losmandy style rail. 3.5" diameter main tube and 4 1/16" diameter dewshield. OTA is 17 1/8" long and 19 3/4" with dew shield extended. 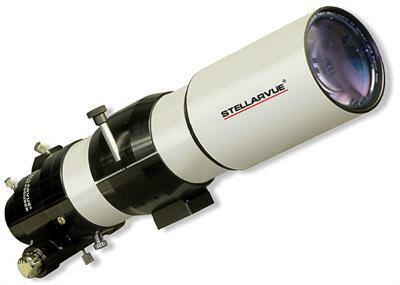 Click the button below to add the Stellarvue SV80ED Doublet Refractor to your wish list.